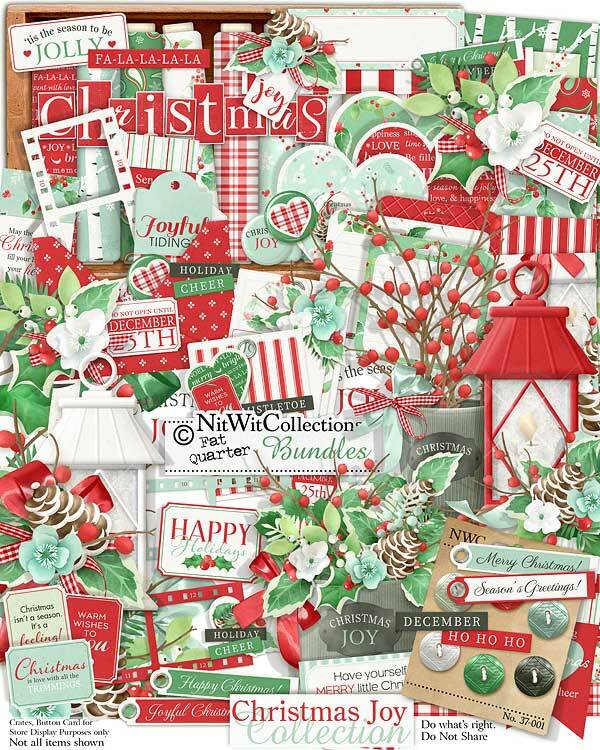 FQB "Christmas Joy" Collection brings together the looks and feelings of a decorative Christmas using Mother Nature's bounty! 1 Arrangement of holly, twigs, pinecones and more in a Christmas planter you're sure to love! 1 Banner - "Send Christmas Joy and Cheer"
1 Banner - "May the Magic of Christmas...."
1 Flair button - "Christmas Cheer"
1 Flair button - "Christmas Joy"
1 Label - "Have yourself a Merry Little Christmas"
1 Sentiment - "'Tis the Season...."
1 Sentiment - "Christmas Joy"
1 Tag cluter in red and white with greenery - "Warm Wishes to You"
1 Ticket element - "Do No Open Until Decemeber 25th"
1 Ticket element - "Warm Wishes to You"
1 Ticket element - "Christmas isn't a Season...it's a Feeling"
1 Ticket element - "Christmas is Love..."
1 Ticket element - "Happy Holidays"
1 Title cluster that is richly adorned - "Merry Christmas"